Sensor 1 refers to the sensor mounted in front of the three-way catalytic converter (twc) and located near the engine assembly. Refer to dtc p2195 (see page es-292). After the engine is warmed up, the ecm performs air-fuel ratio feedback control to maintain the air-fuel ratio at the stoichiometric level. 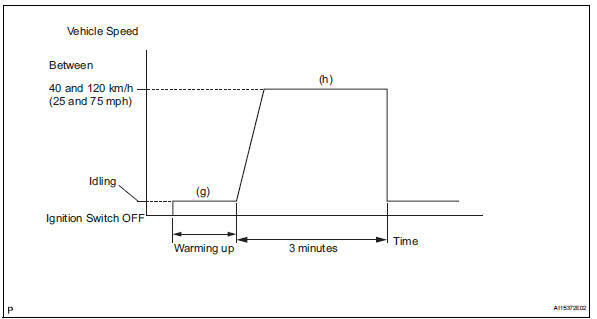 In addition, active a/f control is performed for approximately 10 seconds after the preconditions are met in order to measure the a/f sensor response rate. During active a/f control, the ecm forcibly increases and decreases the injection volume a certain amount, based on the stoichiometric air-fuel ratio learned during normal air-fuel ratio control, and measures the a/f sensor response rate. 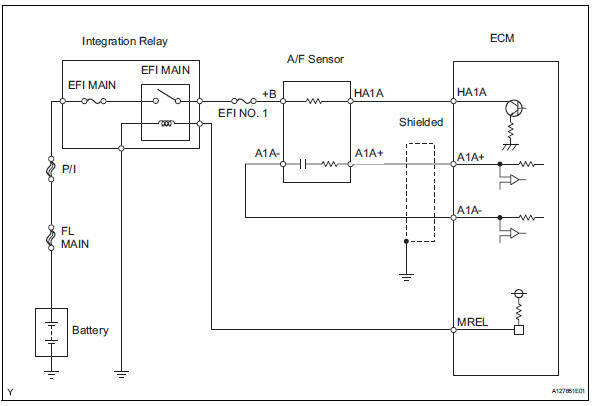 The ecm receives a signal from the a/f sensor while performing active a/f control and uses it to calculate the a/f sensor response rate deterioration level. If the a/f sensor response rate deterioration level is less than the threshold, the ecm interprets this as a malfunction and sets the dtc. Performing this confirmation pattern will activate the a/f sensor response monitor. 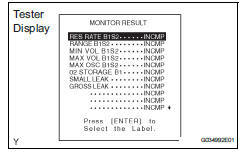 Select the following menu items: diagnosis / enhanced obd ii / monitor info / monitor result. Check that res rate b1s1 is incomp. Drive the vehicle at a constant speed of between 40 km/h and 120 km/h (25 mph and 75 mph) for 3 minutes. Check the monitor result values on the intelligent tester by selecting the following menu items: diagnosis / enhanced obd ii / monitor info / test result. 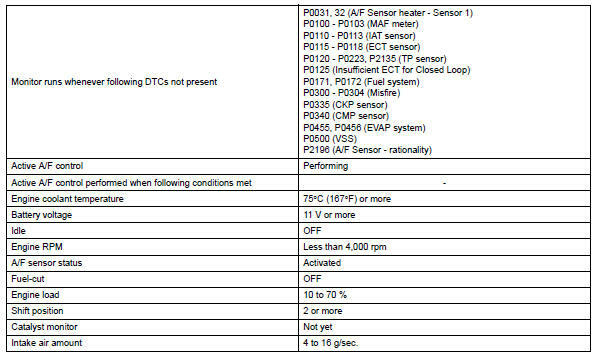 If the values indicated on the tester do not change, perform readiness monitor drive pattern for the a/f sensor and the heated oxygen sensor (see page es-19). 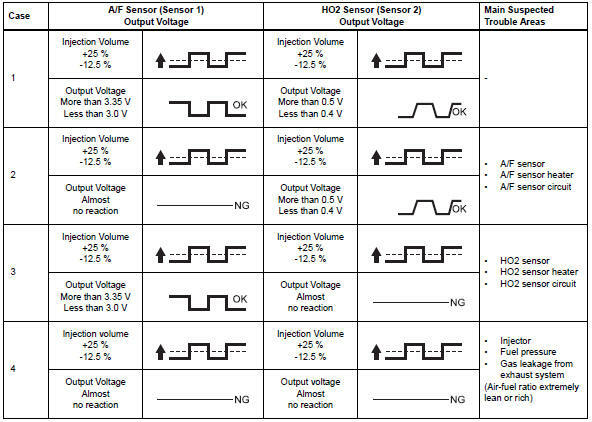 Completion of all a/f sensor monitors is required to change the value in test result. Note the value of the monitor result. Check if any dtcs (any pending dtcs) are set. Intelligent tester only: malfunctioning areas can be identified by performing the a/f control function provided in the active test. 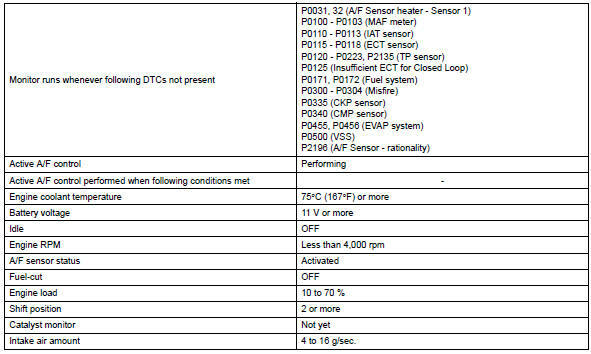 The a/f control function can help to determine whether the air-fuel ratio (a/f) sensor, heated oxygen (ho2) sensor and other potential trouble areas are malfunctioning. To display the graph, select the following menu items on the tester: diagnosis / enhanced obd ii / active test / a/f control / user data / afs b1 s1 and o2s b1 s2; and press the yes button and then the enter button followed by the f4 button. Dtc p2a00 may be set when the air-fuel ratio is stuck rich or lean. A low a/f sensor voltage could be caused by a rich air-fuel mixture. Check for conditions that would cause the engine to run rich. A high a/f sensor voltage could be caused by a lean air-fuel mixture. Check for conditions that would cause the engine to run lean. 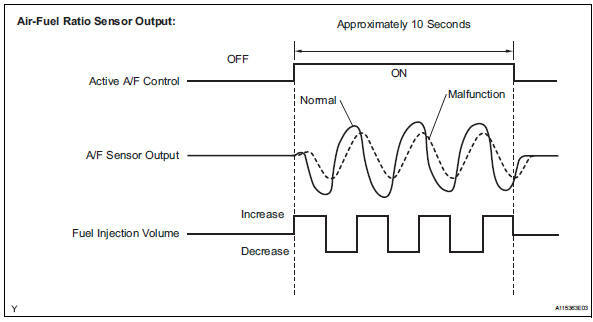 If any dtcs relating to the a/f sensor (dtcs for the a/f sensor heater or a/f sensor admittance) are output, troubleshoot those dtcs first.